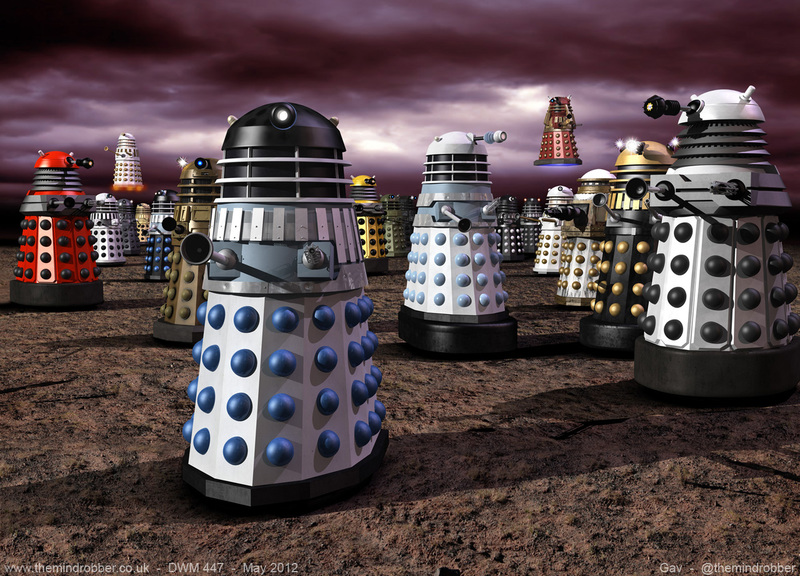 In the summer of 2012 I provided the cover for Doctor Who Magazine issue 447 which utilised virtually every Dalek variant from the classic TV show. 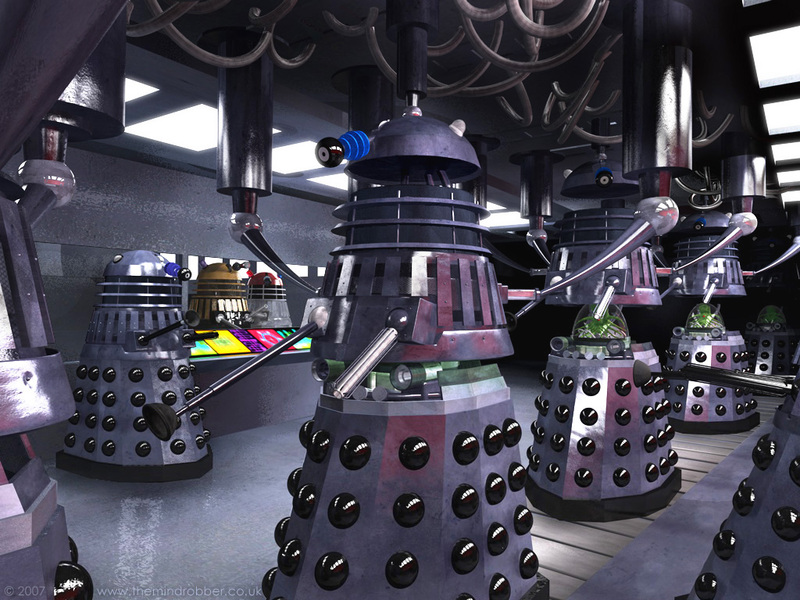 The aim was to provide as much variety and colour as possible, and avoid repetition, so a Dalek Invasion of Earth prop was used to represent the first two serials and Desitiny of the Daleks was not represented. 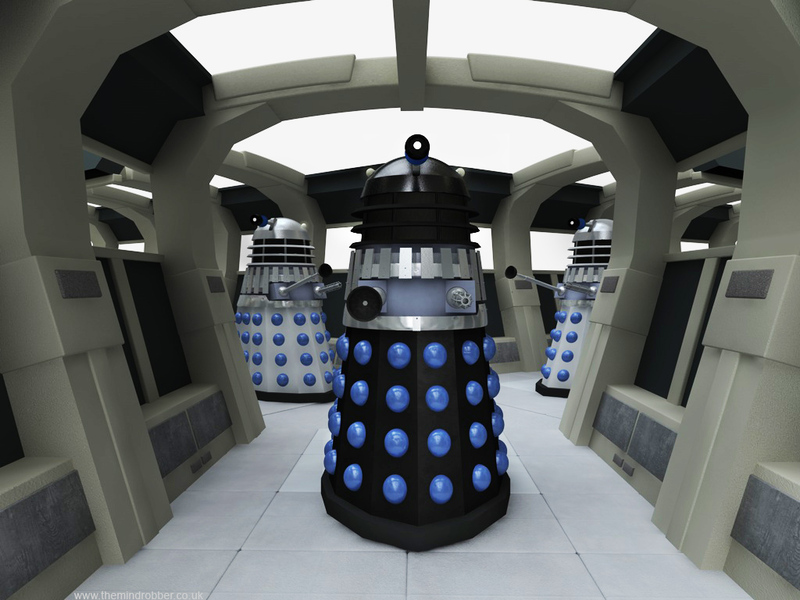 Above right is a pic with some of the models I built for Doctor Who Adventures. 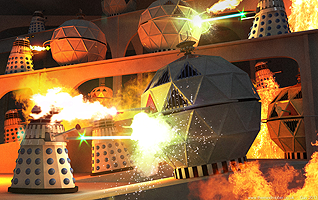 I wanted to make use of the variants from Remembrance because it's a story close to my heart from when I was a kid so I finally did some new art in Jan 2013. 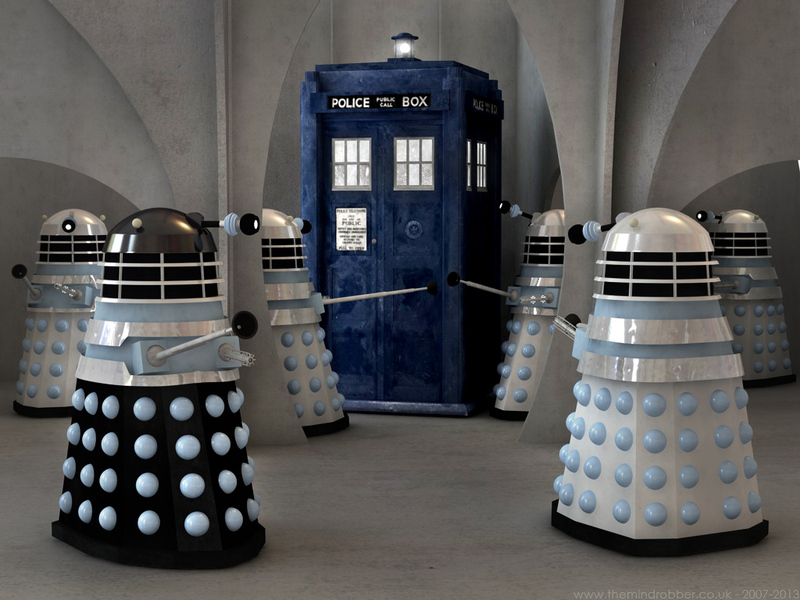 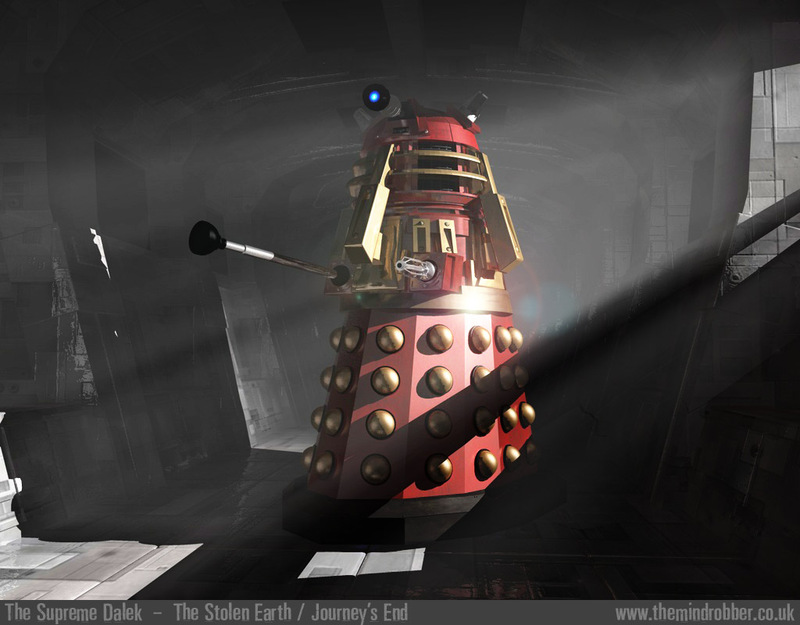 The release of a "Guard Dalek" from The Chase by Character Options prompted much interest in the movie Daleks and their role in the TV show. 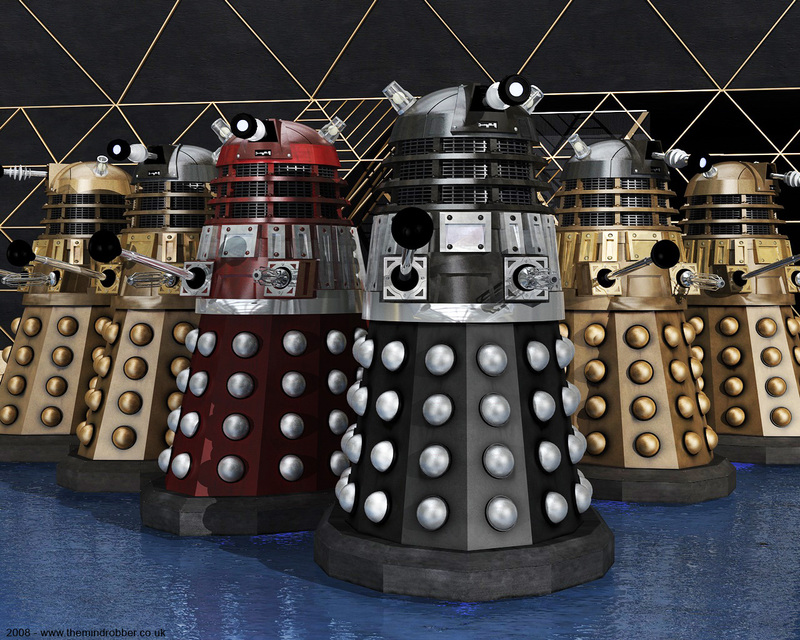 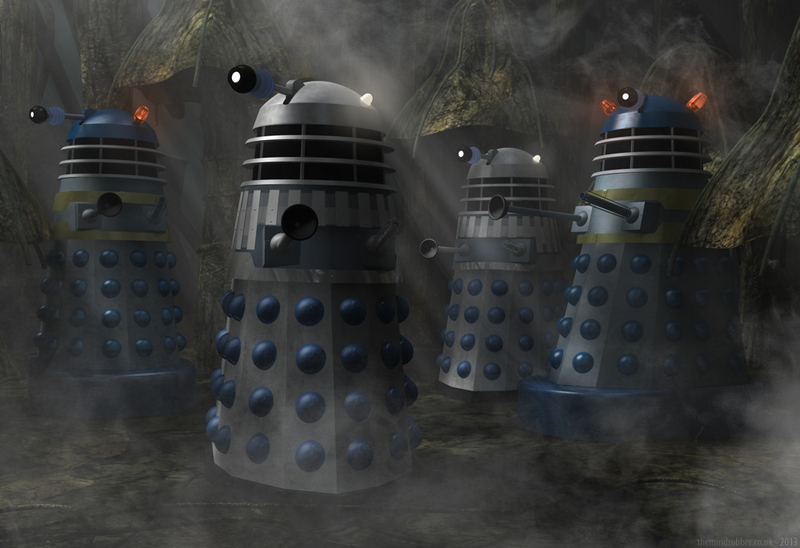 I created the image above of the Daleks in the jungle of Mechanus as a tribute. 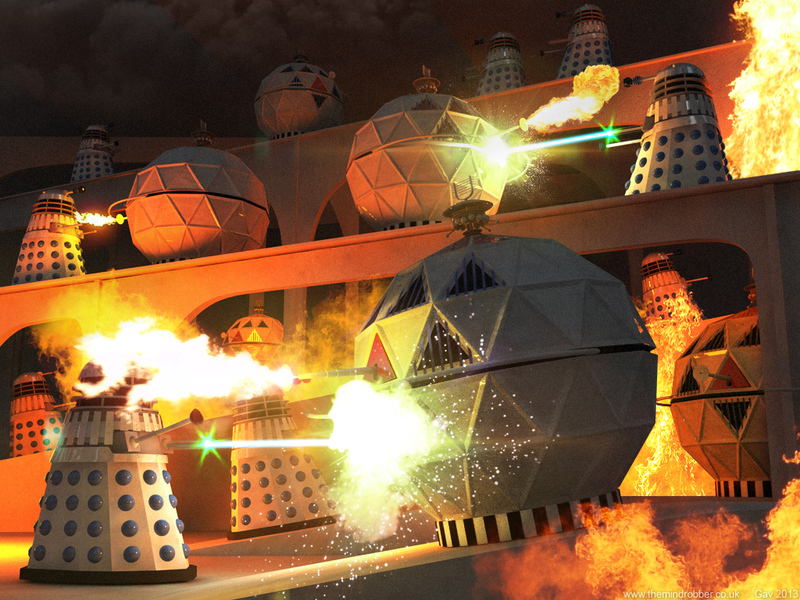 Above right is the climactic finale in which the Daleks battle with the Mechonoids. Something I've been thinking about for ages and finally got round to - when the two emperors meet each other. 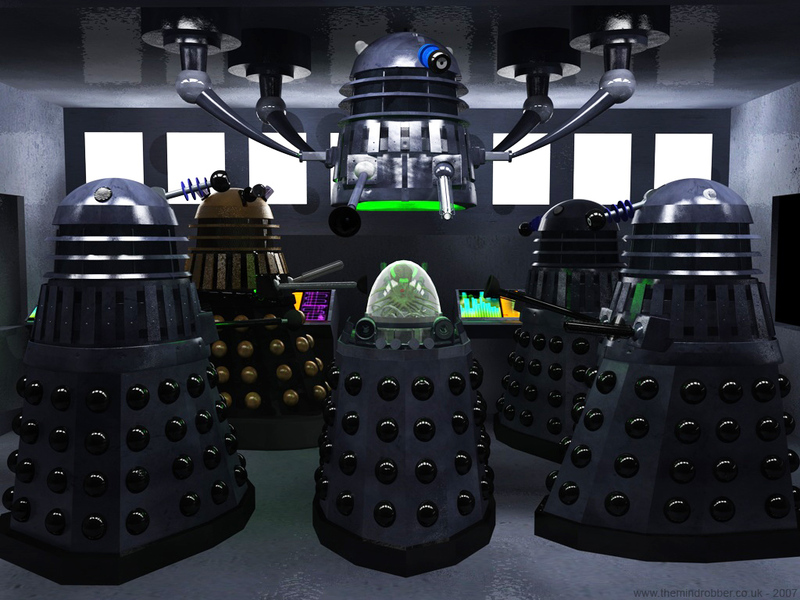 Here the Imperial Daleks and Davros arrive on Skaro in the throne room. 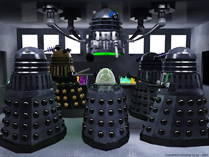 The two rows of pictures above were ones I'd previously put in the reject bin, feeling they weren't of a good enough standard to put online. 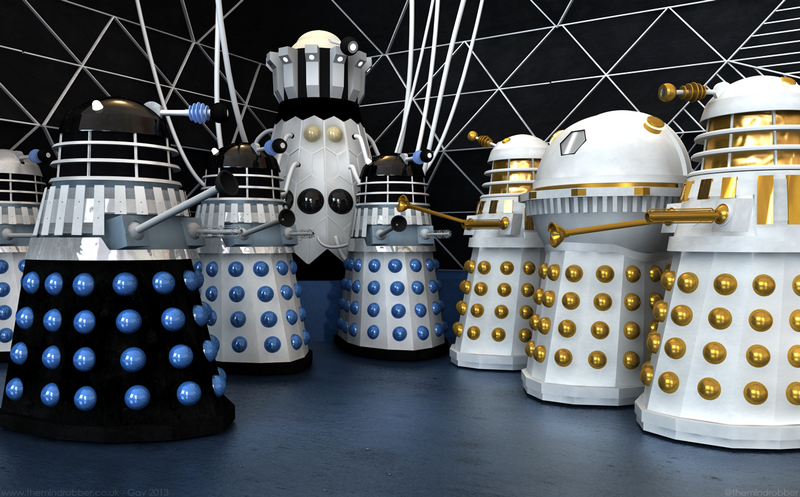 The bottom middle image is an old setup I gave up on but this time I've revampted it, sorted the lighting and re-rendered it. 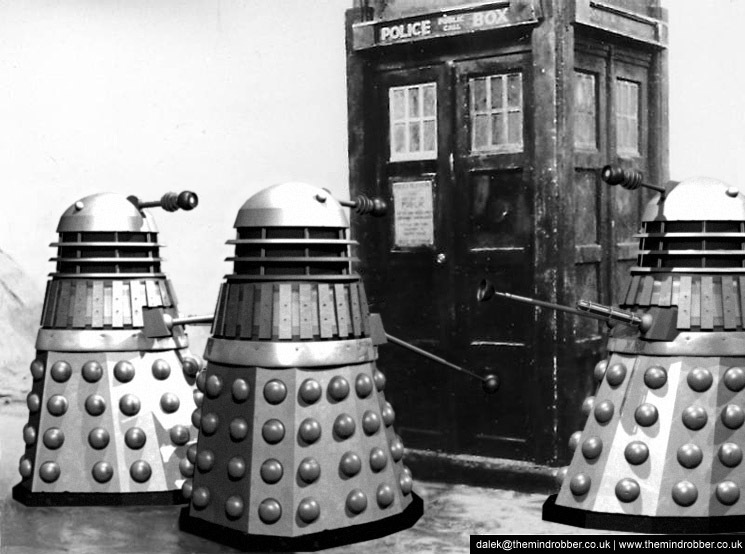 It features a an original Black Dalek as only ever seen in Curse of the Daleks. 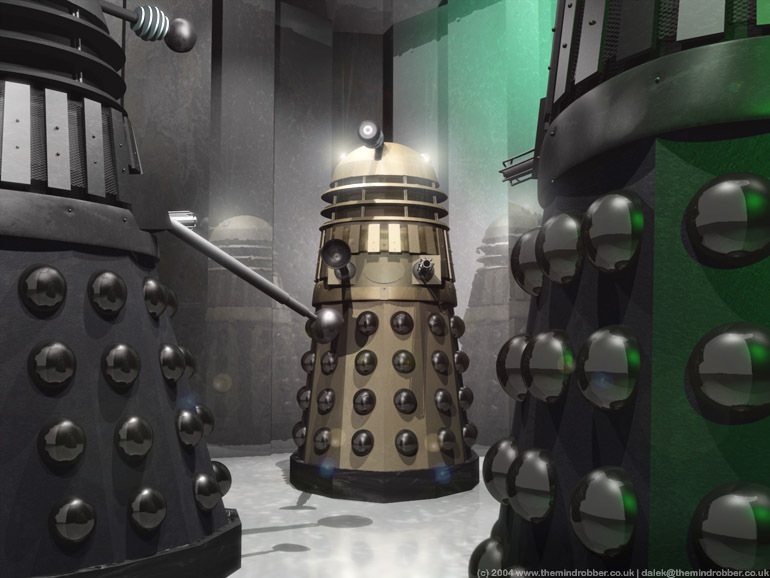 Above is Series 4's Dalek Supreme and then the other interestingly-coloured version of The Supreme Dalek when he appeared in Planet of the Daleks... 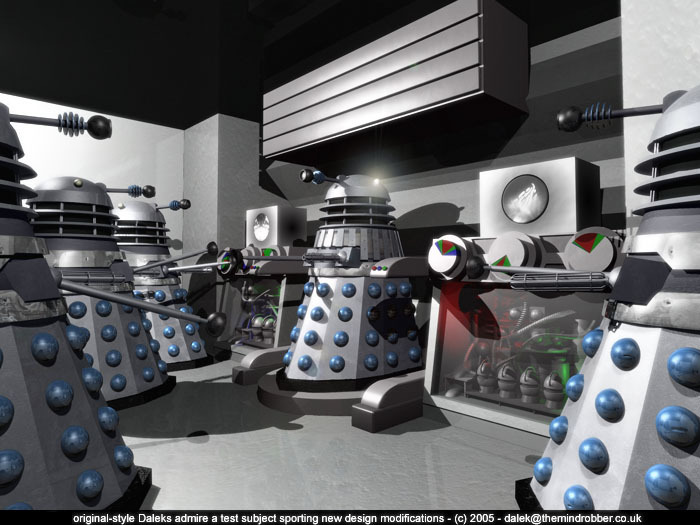 In 2007, I created a Dalek Production Line inspired by The Power of the Daleks and Planet of the Daleks in which they amass a huge army on the planet of Spiridon and then hide it within an Icecano. 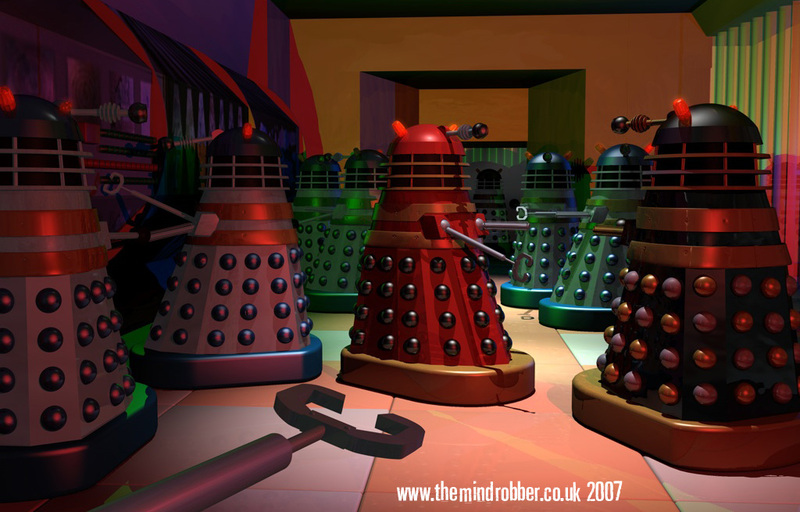 Two images here show "The Red Top Dalek" which has a mythology outside the show. 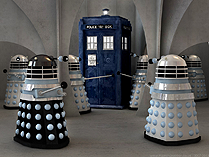 The prop appeared on screen in the second film, Daleks Invasion Earth 2150 AD before ending up in the hands of Terry Nation. 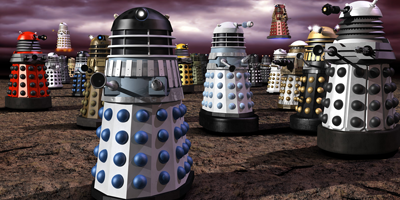 It also appears on those Weetabix cards and in comics. 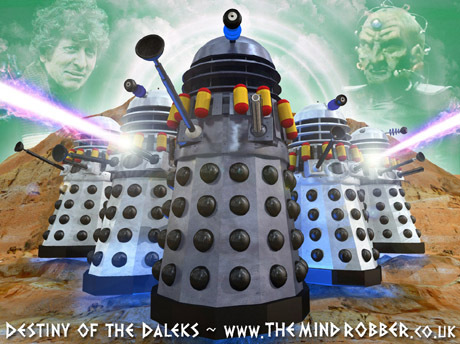 You can read about it in full at Dalek 6388 here. 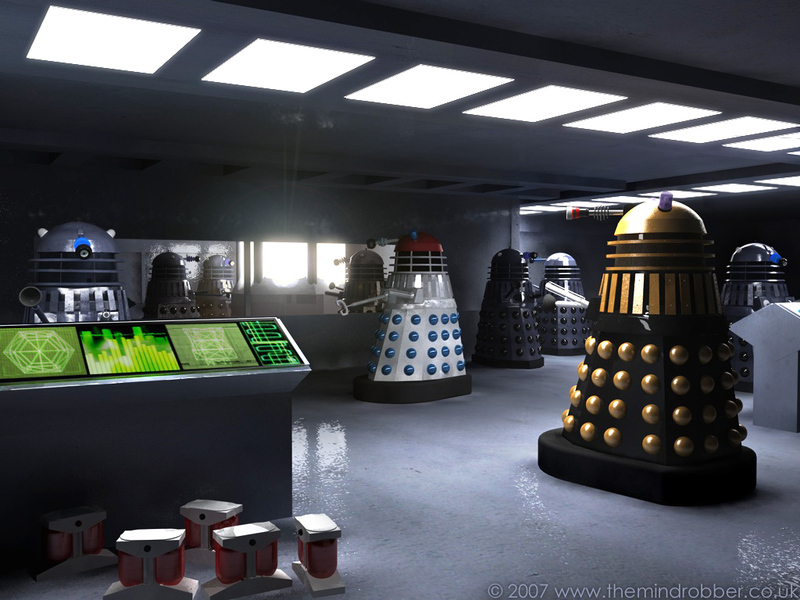 I haven't the patience to properly model rooms, so unfortunately there's only a half-hearted attempt at the control room. 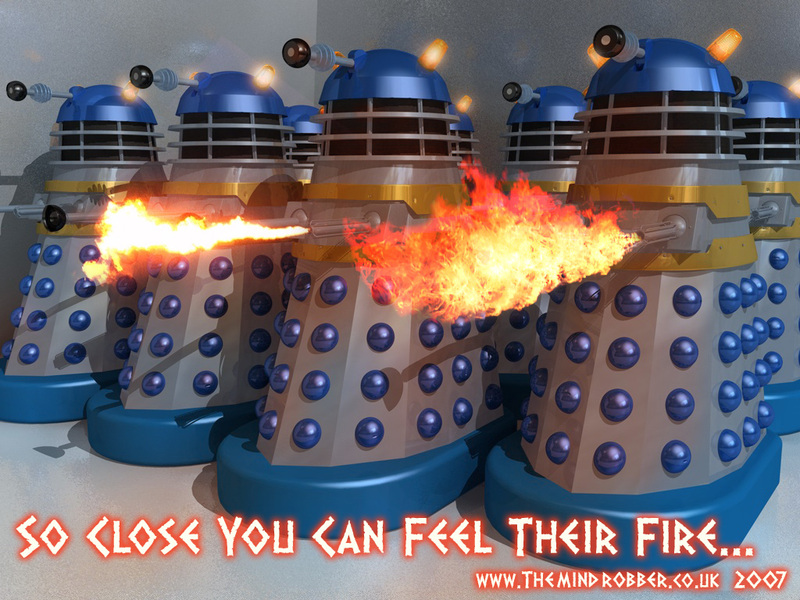 The shot above shows how they might have been had they been able to get away with the flame throwers. 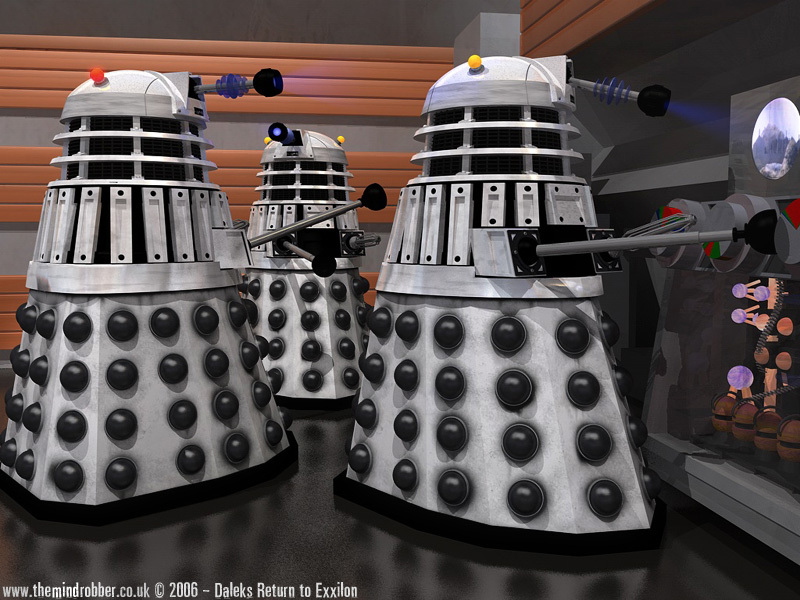 The film Daleks have a lot in common with the new series Daleks, with their enlarged fenders and large "ear" lights. 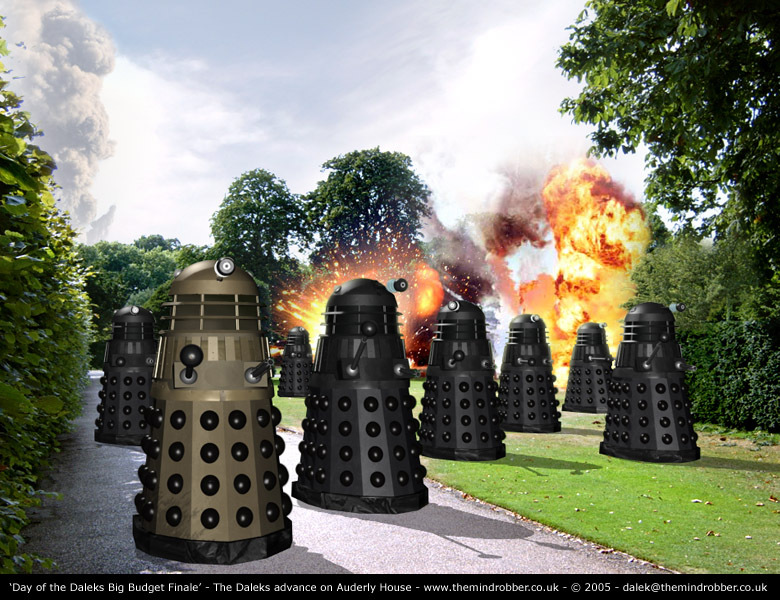 During 2006 my work on the season 2 DVDs I made loads of corrections which you can read about on the new series Dalek page but once it was done I decided to have some fun with it. 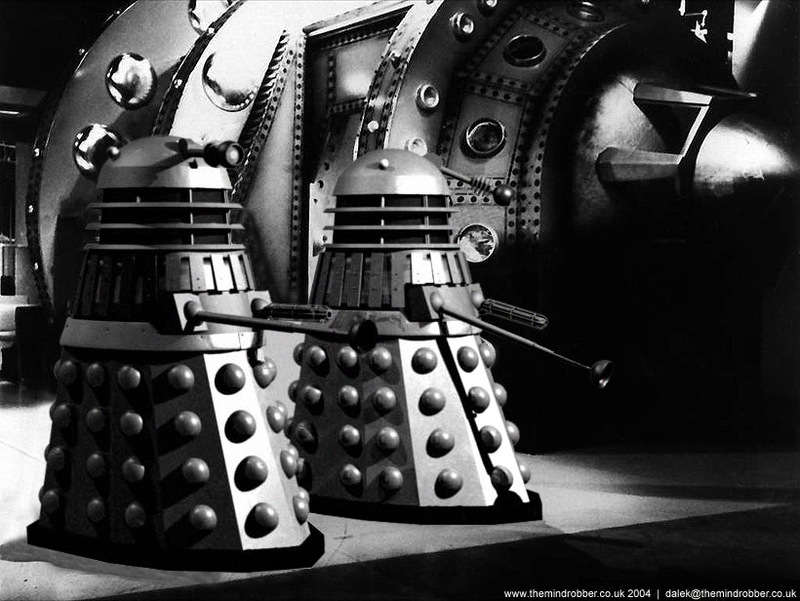 I've always liked the black and white colour scheme from Death to the Daleks so this is what transpired. 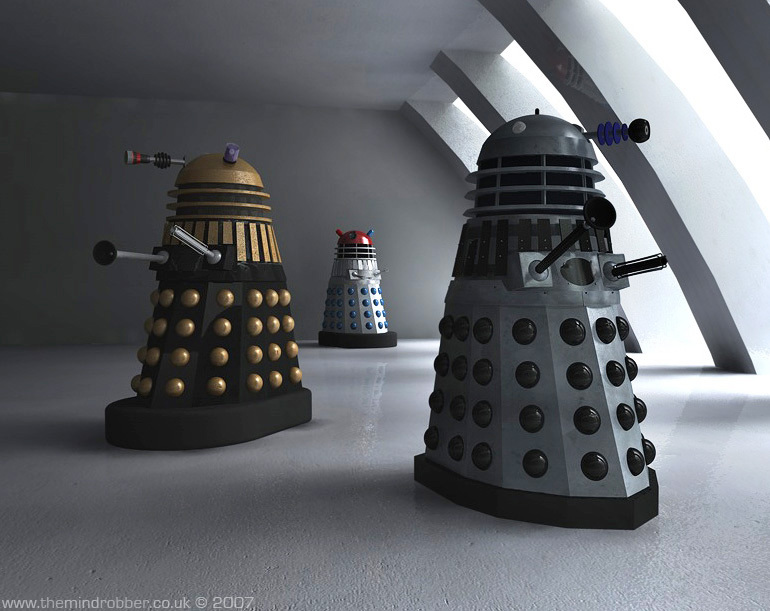 As part of the work for the series 2 box set it required me to explore the innards of the Daleks and recreate some of the many internal workings that had never fully been seen. 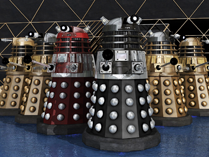 I looked a little to the Terry Nation's Dalek special cut-away but otherwise just my imagination. 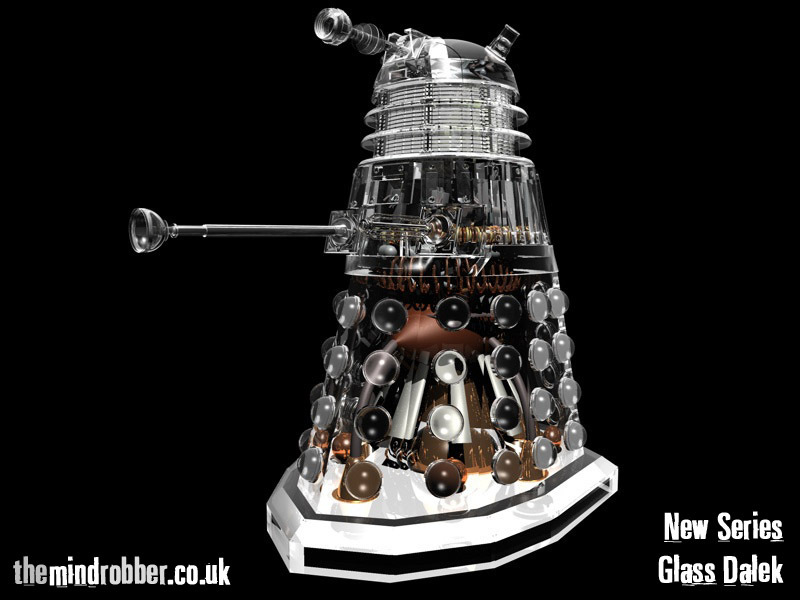 So, picture above is a new series version of the infamous glass Dalek. 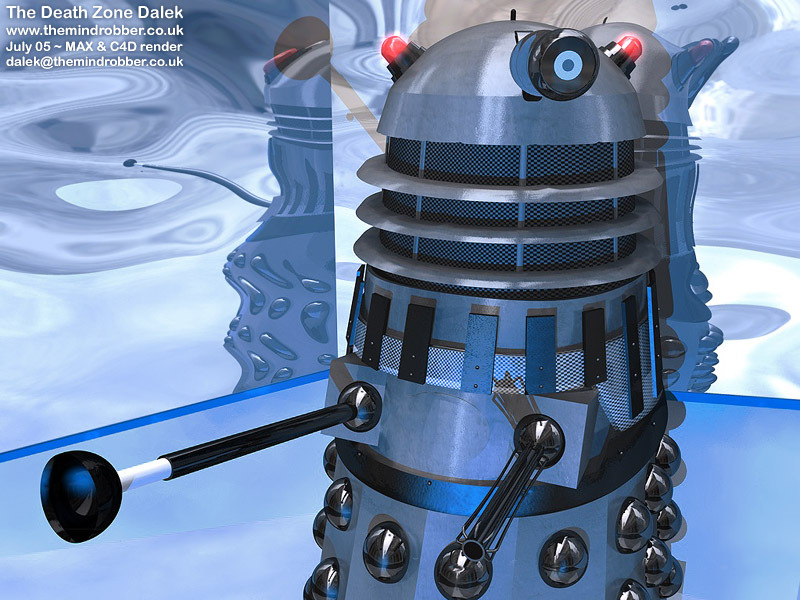 As of July 05 I started using Cinema 4D to render, instead of MAX. 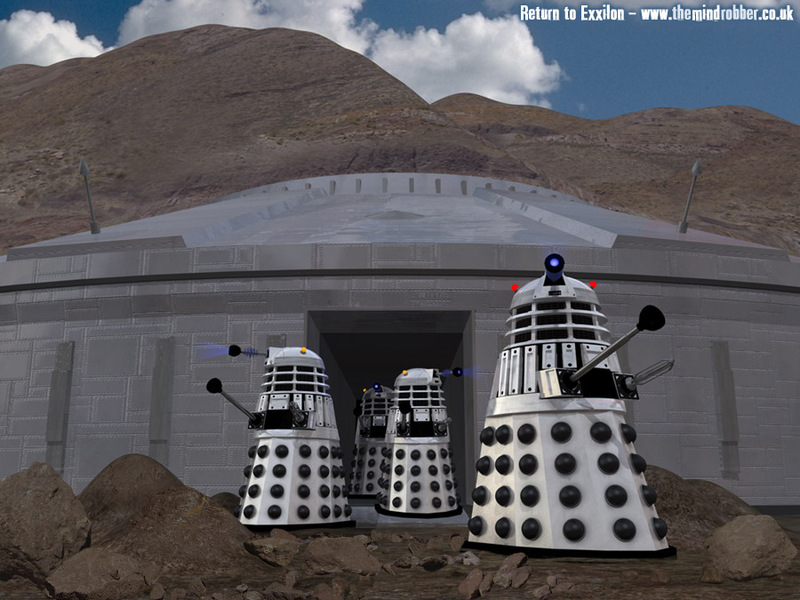 The scene shown above right is one of the first things I did - a re-creation from Planet of the Daleks in which of one of the Supreme Council from Skaro arrives with his entourage to take command of operations on Spiridon. 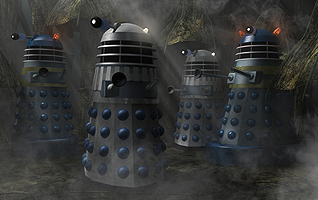 The image above shows the Dalek from The Five Doctors. 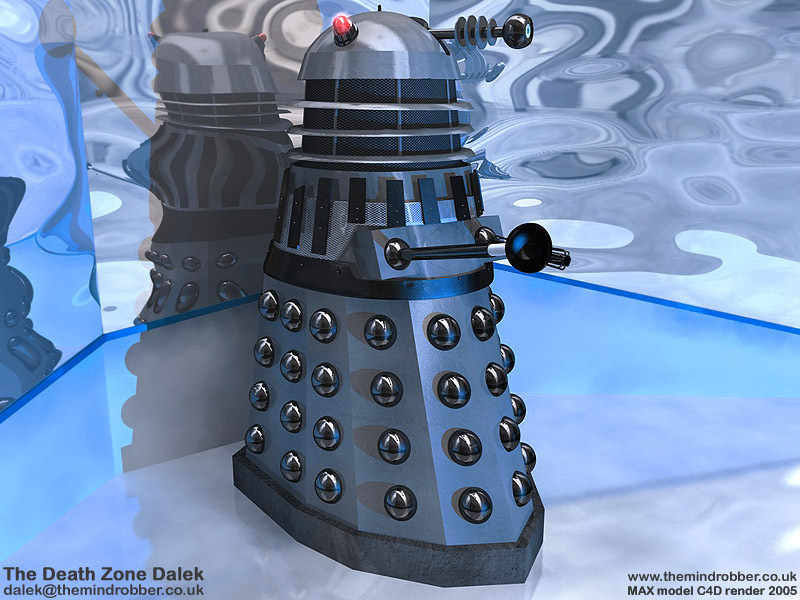 I spent a lot of time making this Dalek as accurate as possible, which is to say, making it look rubbish, although the surfaces are too reflective. 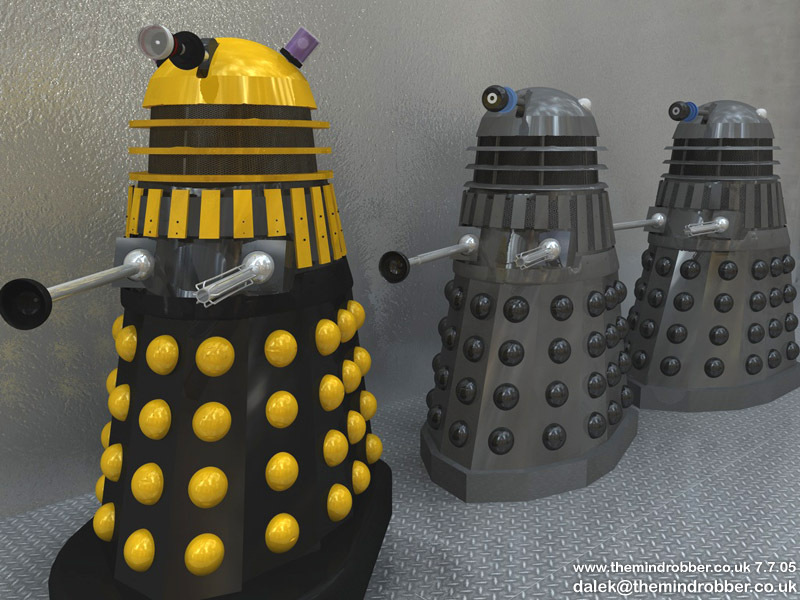 Shown on the right is my last render done in MAX. 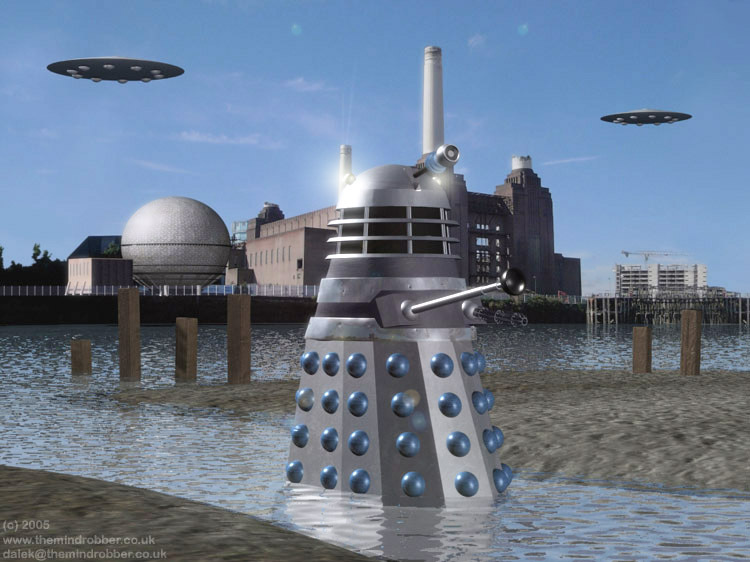 It depicts two original Daleks looking admiringly at a drone who has been the subject of certain modifications designed to take them outside the city. 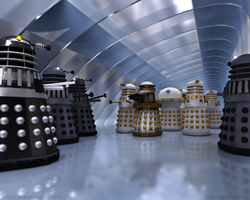 This image above left is from Death to the Daleks. 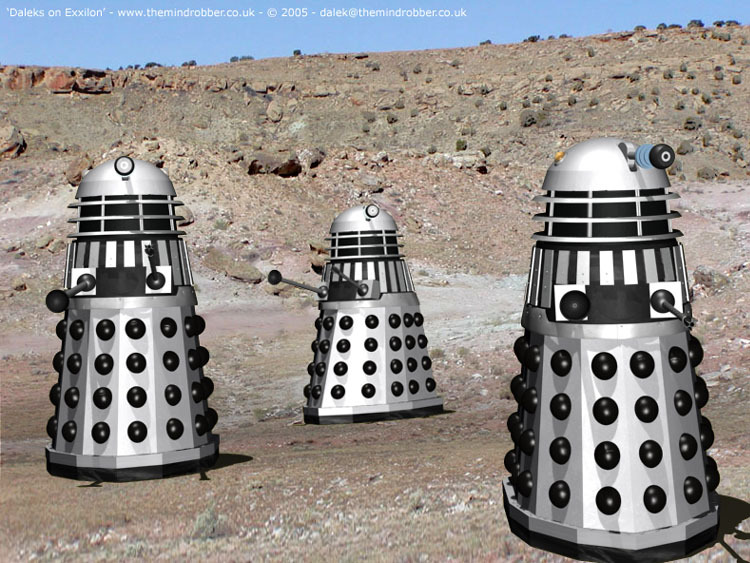 My image shows three Daleks all with their bullet-firing guns, wandering around the Exxilon planet which did look very like a quarry. Next are a couple of classic Doctor Who Dalek photographs into which I have dropped my models. 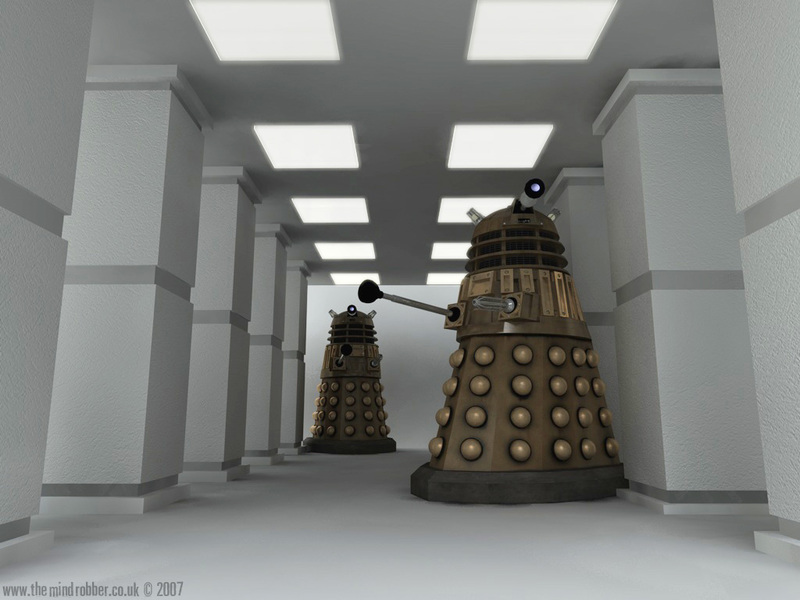 At this early stage of work in 2004 I was using photographic backgrounds from Power of the Daleks and from The Chase.